I lived 30 minutes from Six Flags over Mid-America just outside of St.Louis when I was in high school. Back in 1984 they introduced a short-lived standing rollercoaster called the Rail Blazer. The story was sensionalized locally and there were a few different versions of the incident. A large woman and her husband was secured in the last car of the roller coaster and the ride was sent on its way. When it returned and the end of the run, there was only one passenger in that car. A woman was missing and her husband claimed she was flung from the car during one of the turns. She died from the fall and some unlucky teenager had the grusome task of locating the body among the trees below. The old UPI article is posted here on the NY Times site. When we first moved down to Dallas, my wife and I used to do small day trips from the city to check out the kooky things the neighboring towns had to offer. 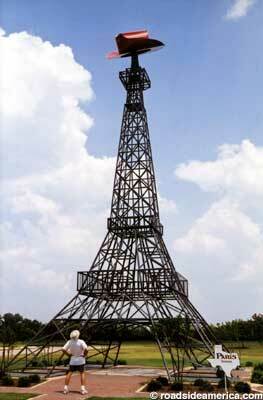 Paris Texas used to be the home of the world’s second tallest Eiffel Tower until they got competition from another one in Paris, Tennessee. I think they went back and forth with that one to eek out a few feet and keep the honor, but then was later squashed by the much larger one built in Vegas. They’ve since added a giant cowboy hat to the one in Paris, TX – which I took as a sign of surrender. Paris, TX is also home to the Evergreen Cemetery which features a large gravestone statue of a Jesus wearing cowboy boots. We took a few photos when we were there, but you can also find them on the web. Here are some words you don’t hear often, “if a woman has something implanted permanently, it might as well do something useful”. Those are the words of UK-based BT Laboratories’ analyst Ian Pearson who says computer chips that store music could soon be built into a woman’s breast implants. Flexible plastic electronics would sit inside the breast and signal would be relayed to headphones, while the device would be controlled by Bluetooth using a panel on the wrist. “It is now very hard for me to think of breast implants as just decorative”, he said in a recent interview. “If a woman has something implanted permanently, it might as well do something useful”. Pearson added sensors in the chips could also monitor the electrical impulses and warn wearers about heart murmurs, blood pressure increases, diabetes and breast cancer. Chuck Klosterman of Esquire wrote a good article about expanding your musical horizons. This supports my belief that people in their 30’s & 40’s have simply given up on finding new music. New music isn’t necessarily that much worse, you’ve just stopped trying. Regardless, of your age you probably feel that the music industry peeked in the decade from your age of 16 to 26. After that, music coincidentally took a down turn and you haven’t tried many new bands since. I do believe the music of the 2000’s has been a bit saturated and corporate. A lot of what is played on the radio is identical from city to city and seems like watered-down rehashes of the same formula. However, there are still quite a few gems out there if you’re still willing to spend the time to look. Check out the May 2005 Esquire article here. Just for trivia’s sake, I happened to have the Black Keys, Secret Machines and TV On The Radio. I didn’t know most of the other music mentioned in the article.